Pretoria is a city of extremes. Mega shopping malls with over 500 shops compete against game parks featuring the Big Five, as well as historical monuments and museums housing rare ancient artifacts. With this book, discover spectacular attractions such as the Cradle of Humankind, a 220 000 year old impact crater site, President Paul Kruger's house, the largest zoo in South Africa, the official seat of the South African government, and more. Your visit to Pretoria can be the trip of your lifetime, with memories, pictures and experiences that rival any other trip you have ever made, if you know where to go and what to see. This guide book can be invaluable to the success of your visit to Pretoria. GPS coordinates or directions to the attractions. Come to South Africa, where you can awaken the wild side in you and experience your dreams. Preparing for a vacation is exciting and can be a rush. Often, little things can make a big difference to having a successful trip. 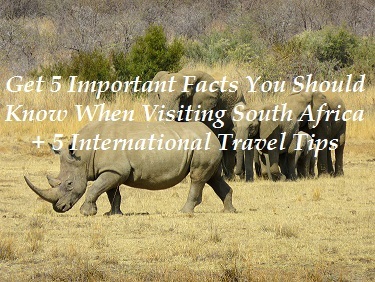 Here are 5 facts you should know when visiting south Africa, from my book; South Africa: 50 Facts you should know when visiting South Africa.